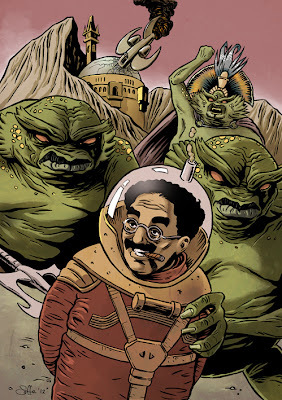 Grimm Tidings: Groucho in space! A recent commission - the brief was the 3 words in the title of this post, the rest was left up to me! The result is a blend of certain influences I've been absorbing lately: Plague of Frogs-arc BPRD, John Carter, Moebius and The Creature From the Black Lagoon. Colour-wise I wanted to try something slightly different, at least in terms of the palette used, hence the hazy pinkish cast which is supposed to evoke the strange light on an alien world.